Just wondering how you can graduate as an MD with a diploma? MD (I'm assuming you mean medical doctor?) is essentially a Ph.D. The requirements are strict as far as nursing is concerned. Unless you fulfill the hour requirement, you will be required to take a refresher course. I realize it's not going to be easy, but you will likely continue to face roadblocks if you don't relocate soon. Unfortunately, you're now an "old" new grad in the eyes of employers, who can afford to be selective. The GTA has been a tough market for 10 years. But small towns and areas to the north will take whatever they can get. You'll get some good experience also. I went rural for 4 years and then moved to the city. Working rural taught me how to survive the politics of nursing and how to function with few resources. Good luck and happy new year! If it's at all possible for you to relocate, I would strongly consider it. Guelph is still part of the extended GTA and all of those surrounding cities are saturated with applicants. Small towns and remote areas to the north are always looking. Not ideal, but you need to work. What Lori said.... Start studying/ reading early so you aren't pulling all nighters. Organization including your version of a to-do list is essential. Find time for fun too (why planning is needed). Many of us worked throughout our programs and still had good grades. It is possible. Some posters have referenced the Code of Ethics, and "nowhere does it say...." We are bound by the Code of Ethics and the standards set forth by each Provincial licensing body. There are very clear guidelines about what the SRNA considers professional conduct. We can agree or disagree, but the fact is that if we want to maintain our license, we are bound by those standards (whether we like it or not). This has nothing to do with her employer, universal health care, or the government. As far as SRNA is concerned, this nurse has been unprofessional. In order to avoid these situations, be careful about social media. As I've mentioned in an earlier post, she is not the only one (unfortunately). I've read similar disciplinary accounts. It just isn't worth the headache. I have 50 friends on facebook, and we don't discuss work at all, or anything related. I personally don't view this as being silenced. There are other ways to address concerns and facebook isn't one of them, IMO. Nursing School Leading to NP or OT? If you had to do it all over? That's why I prefaced my post with "It depends where you live" In Canada, PT and OT are Masters degrees. OP, I'll be honest. As a hiring manager, if I received a cover letter that explained personal information or referred to expertise (which as a new grad you do not have in nursing), I would put your letter aside. Competition is fierce. Be very specific and relate your skills to the employer. Depends where you live. It's actually not as uncommon as you might think. I have known of a couple of nurses who went on to do their OT or PT. Both are two year Masters programs and a health background is preferred entry to the program. I considered going the OT route myself, but I decided to do an MPH. Agreed. Your cover letter is too long. 3 concise paragraphs and a closing line is all you need. Also, you should try to link the mission and values of the company in some fashion. Employers want to know in concrete terms how your credentials will add value to their team. Why should they hire you over the other 200 applicants? Writing about why you are interested in nursing and the birth of your son is not going to win them over. Review sample nursing cover letters on the internet. There are some good examples out there. Paragraph 1: Tell the employer which job you are applying for and express interest in the position, but be brief. Have you recently completed a placement in this area? Paragraph 2: Link their mission and values with highlights of your previous work/ volunteer experience. What have you done that adds value to their team? Paragraph 3: Thank them, tell them how you can be contacted. You have repeated yourself in your closing paragraph. Omit the P.S. Working at LTC- What is your daily routine? The routines vary according to the facility. Find out how and where you can access key policies and procedures, including your parenteral manual (usually online). Your facility likely uses a daily communication book or sheet where staff can record pertinent information about the residents. Also know the procedure for sending someone to acute care, and how your physicians expect to be notified. You should also be familiar with your residents goals of care, especially those individuals who expect to be resuscitated. Emergency procedures is another. Exactly Ruby. You can say whatever you like on facebook, including criticizing the care provided. The fact that she identified as an RN got her in hot water. Some of those nurses got wind of her post and reported her to SRNA. They were then obligated to investigate. It isn't only the SRNA. If I made a similar post on FB, I would run the risk of being reported to CARNA (Alberta's licensing body) and face similar disciplinary action. I can see both sides. HOWEVER, the policies and procedures governing nursing in Canada are very clear about social media use, particularly over the last 5 years. Every month there are disciplinary notices posted in the nursing magazine that I receive, and at least one relates to social media use. I know not to post anything related directly to work or patients. Unfortunately, this can happen to any of us. Canadian nurses are governed according to the standards and guidelines set forth by the College of Nurses (in this case SRNA) and the Code of Ethics. Because she openly criticized other RNs and informed the public on social media that she was an RN, the SRNA has grounds to charge her with professional misconduct. That is the issue. This has nothing to do with the government, or the fact that we don't have freedom of speech. The nurse in question has been licensed for 12 years. It's not as though she's a recent grad who could plead ignorance. The standards and the code of ethics are very clear as well, and I'm speaking as a Canadian educated nurse. She likely wasn't thinking about the potential ramifications when she posted, but they were there. She should have followed proper channels (not Facebook) to lodge a complaint. We are all well aware of the potential repercussions of social media. 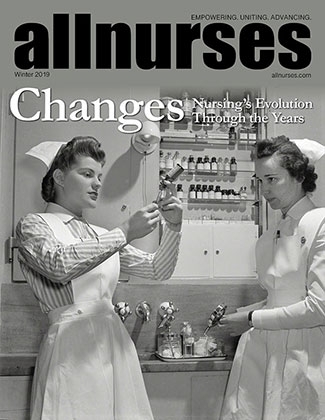 Time after time, there are similar disciplinary accounts reported in our nursing magazines. IMO, it just isn't worth the risk. We have freedom of speech, but as another poster mentioned, there are consequences.